Forget everything you know about sports drinks. Isagenix has created what we believe to be the best sports drink on the market. Isagenix Replenish is a refreshing beverage that delivers the electrolytes and nutrients that rehydrate, replenish, and re-energise athletes in a way that water alone cannot provide. Replenish contains no potentially harmful artificial flavours, sweeteners, or colours. This high-performing beverage is also gluten-free, soy-free, suitable for vegetarians, and dairy-free. Enjoy better quality and longer training sessions with this unique natural energy drink. People using this product have reported more energy, improved performance and increased endurance. This product is simple to bring with you on the go since it is available in convenient sticks as well as powder canisters. It comes in multiple delicious flavours and is ideal for mixing right into a half-litre water bottle. Replenish the electrolytes and nutrients that are lost during lengthy or intense workouts to stay hydrated naturally. In order to help you perform at top levels, Glycogen Complex with a specialized blend of fast-absorbing carbohydrates is found in Isagenix Hydrate (previously replenish). It also provides a full complex of B vitamins, electrolytes, and 100% of daily vitamin C requirements. Product Price: $27.99 – Save $9! athlete, it is absolutely necessary to stay hydrated. Your performance is hindered by even small losses in body fluid. This can result in decreased reaction time, a lack of concentration, and lethargy. Weakness and muscle cramps can also occur when you have a lack of sodium caused by sweat. Sweating is a leading contributor to sodium and fluid loss, and you sweat a lot during exercise. In the process, you also lose vitamins, electrolytes, and other important nutrients. Replenish was designed to assist in maintaining and restoring water balance along with sustaining performance, aiding in faster recovery, and re-energizing. B-complex and vitamin C enriched, this refreshing beverage keeps you naturally hydrated while replenishing those important electrolytes and nutrients that are lost while working out. Research continues to show that taking in more carbohydrates during exercise helps to enhance endurance and performance. But, you cannot get this effect with just any carbs. Simple sugars will lead to abdominal discomfort and distress. Fortunately, Amped Hydrate features a particularly effective glycogen complex with useful carbs that increase energy, restore shortages that could inhibit performance, and help spare muscle and liver glycogen stores. This all allows you to perform at your best. When is the best time to drink AMPED Hydrate? The simple answer is any time you need a natural energy boost or refreshment. Yet, after or during exercise is when it can be especially beneficial. During your workout, try adding the contents of Replenish directly to your water bottle. Does Replenish support a lifestyle of total health and wellness? Replenish supports the physical exercise part of a total health and wellness lifestyle by supplying replenishment and energy after and during exercise. Add a boost of energy and extra taste to your water during Isagenix Cleanse days by including a small amount of Replenish. Simply pour the contents of one two-serving stick into a half-litre of cold, purified water when preparing the drink with the convenient Replenish sticks. 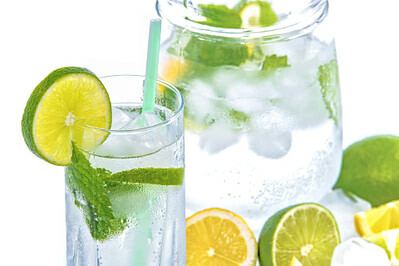 Mix half a tablespoon with 250ml of cold, purified water when using the 45-serving canister. The beverage can be enjoyed during, after, or even before exercise. There are currently two flavours: Juicy Orange Sticks and Lemon Lime Sticks (with more great flavours to come!). 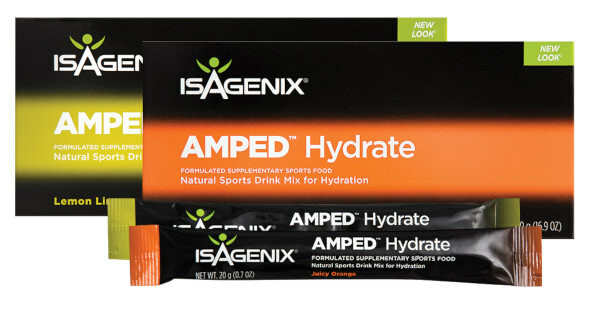 Purchase Isagenix Amped Hydrate today if you are ready to make the most of each and every workout by performing at your peak! Purchase Amped Hydrate today if you are ready to make the most of each and every workout by performing at your peak! Ionix Supreme: Over 100 different botanicals, herbs and other extracts designed to reduce stress & increase energy levels.